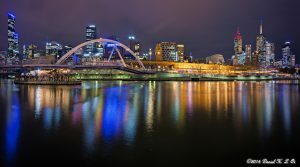 Two of my panoramas have been selected as part of a curated set of Melbourne panoramas at 360Cities. You can see all of my Melbourne panoramas here. I’ve just come back from an impromptu holiday in Toulouse and was able to take panoramas of a few of the historic and beautiful churches there. In particular, I was able to spend some time in Notre-Dame du Taur (panorama) and Notre-Dame de la Daurade. 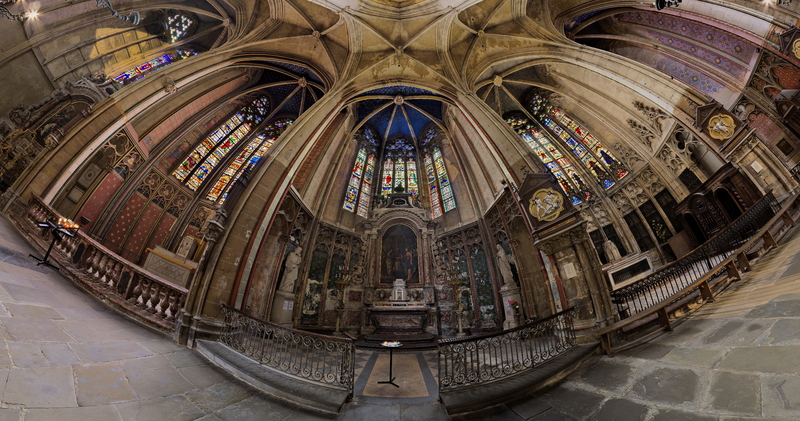 I did manage a pano in the Cathedral St Etienne in the Chapel of St Joseph as shown above. The full panorama can been seen at 360Cities. 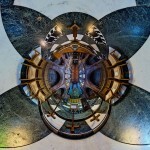 A particular challenge taking panoramas in churches is capturing the beauty of the stained glass windows. In general, it is difficult to get a photo that shows the richness of their colours yet still allowing the interior of the church to be seen since the contrast range is tremendous. It is especially hard when they are part of a full panorama. This can be overcome with a lots of patience and work in post-processing, I have developed an exposure blending technique that avoids the heavily processed “HDR look” yet preserves the intensity of light stream through the stained glass windows. 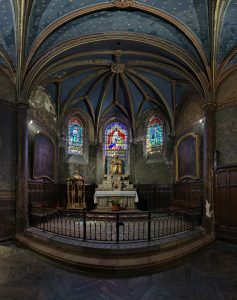 The example here shows the South Chapel of Notre-Dame du Taur. This is especially important in dark churches where the windows would otherwise be white if the photo was exposed for the rest of the church. 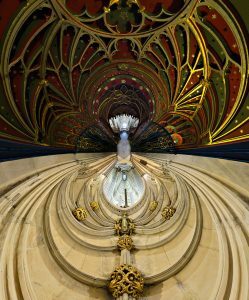 I was pleased to see that my recent pano of York Minster was selected as an Editor’s Pick on 360Cities. 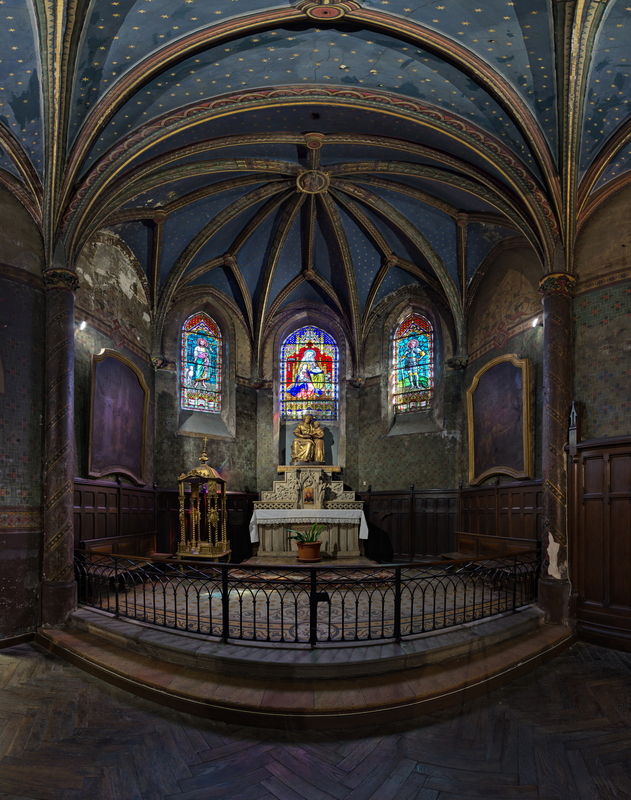 The picture on the left is a stereographic projection of the equirectangular panorama taken underneath the Quire Screen. 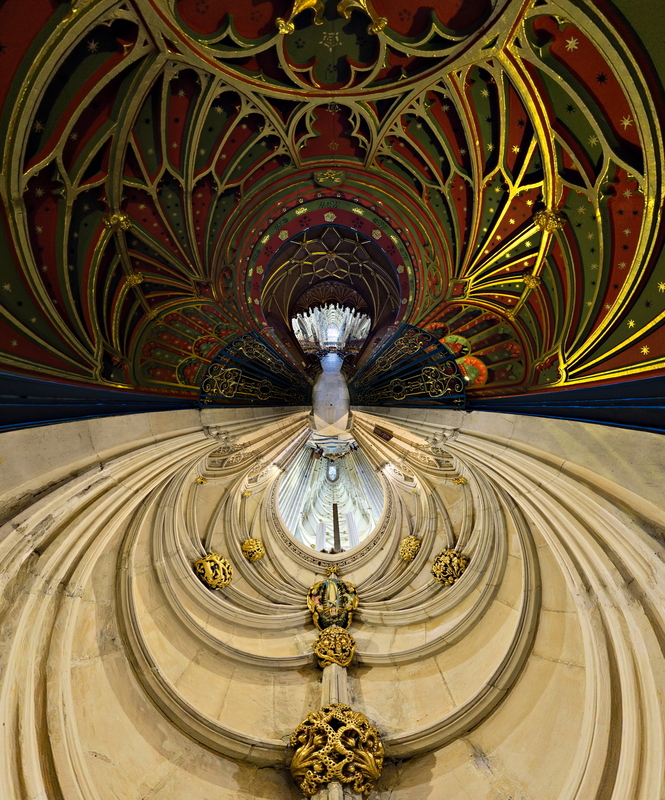 I had the pleasure of visiting York for several days and was able to take a few panoramas of the Minster. Tourist entry is £10 (or £15 which includes a visit to the Tower), it costs a lot of money to maintain such a large and historic building so this entry charge is not so unreasonable. Rather progressively, there are no prohibitions on photography or tripods (as long it’s not for commercial use and your tripod won’t damage the floor). For a panographer, this was a great opportunity and well worth the visit. The main challenge, as is common to churches, is the huge contrast between the darkest shadows and the brightly lit windows. Doing HDR capture is the surefooted, though laborious default procedure. Often HDR and tonemapping gives impressionistic results, derogatively called the “HDR-look”. It isn’t the fault of HDR capture per se but rather the tonemapping settings that are usually to blame for garish results. Alternatively with some judicious bracketing of just the relevant areas, one can produce decent results by exposure blending the shadow and highlights. This is what I have done here, using a moderate amount of exposure compensation on the brightly lit East and West ends of the Minster to retain some detail that would otherwise have been washed out. 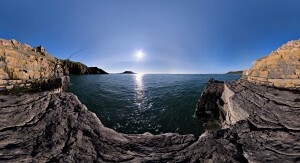 Two more panos from York were selected as Editor’s Picks at 360Cities. The first one was taken in the Chapter House of the Minster. The second was taken outside next to the Minster and the Roman Column. I have been going through some old unstitched panoramas. I thought it would be a good opportunity to test other panorama presentation methods and came across Round.me. Here is a panorama taken in King’s College Chapel nearly 5 years ago. The quality isn’t as good as my current set-up but still produces a workable image. It’s been good to revisit old panoramas, not only has the equipment changed but also my technique, continually improving my methods and workflow to obtain better results, or the ability to shoot in more challenging conditions. As an exercise, analyse why the photos are boring and then seek to do the opposite. Is it because the light is flat an uninteresting? Then find times when the light is dramatic. Is it because the scene is too flat? Then try taking photos from different perspectives, down low, up high. Maybe your post-processing is too conservative. Take artistic licence and play with levels, contrast, dodging/burning, saturation or cropping. Some views are best enjoyed live and don’t translate well into a photo, at least not with a straight interpretation. You could try portraying it not simply in a representational manner but the impression you want to convey. Digital photography and post-processing gives you a lot of power to explore the artistic possibilities of a photo. Getty Images are now licencing panoramas from 360Cities. I am pleased that my panorama of the London Eye was one of the first batch to be vetted for Getty. 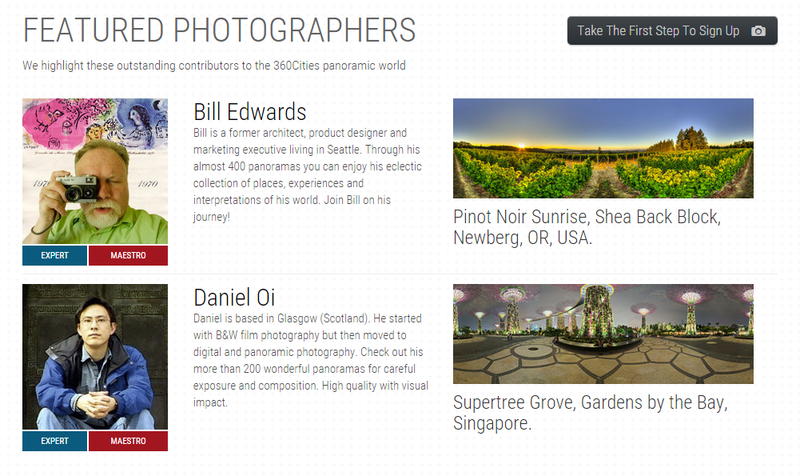 The original pano can be seen on 360Cities. Also available are panos of Melbourne here and here. You can search for my images here. Prints of my panoramas are available, contact me for pricing. 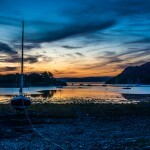 They are available in a variety of sizes and can be printed on photographic paper or canvas. Panoramas can also be licensed through 360Cities. This panorama posed a few challenges. Shooting directly into the Sun is difficult in any case but I bracketed several shots to try to preserve detail both in the sky as well as the sea. The lens coatings have controlled the flare with only a small loss of the sharpness. I also had to be careful not to fall into the water when taking shots all around. Shadows are more difficult to control. Shots from different positions are used to cover up occluded areas. These were inserted directly into the panorama project. I timed my a shot to capture the fisherman casting his line. My latest panorama was taken in the Lady Chapel of Liverpool Cathedral. Compared with the main part of the building, the Lady Chapel is more elaborate and has a wider palette of colours. The stained glass gives a blue tinge to the altar area whilst the red stone provides contrast. 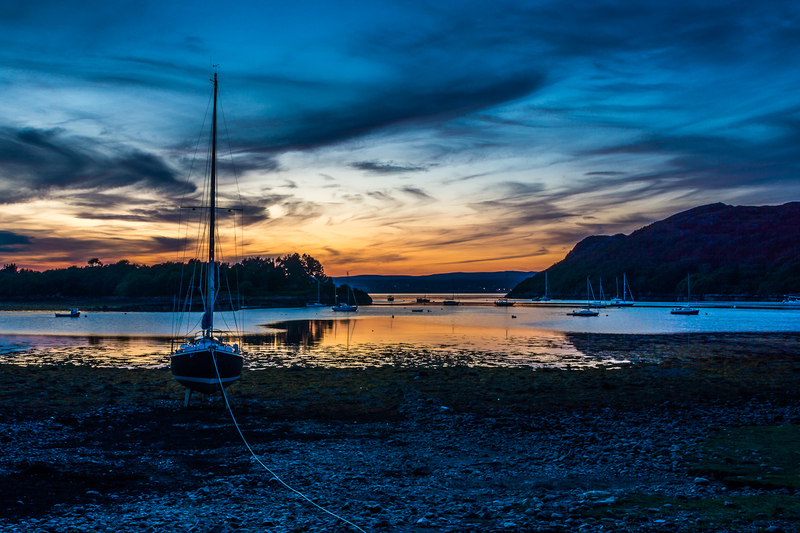 The dynamic range in the scene was captured by bracketing, these were combined into two separate panoramas, one with shadow detail, the other highlights, that were then combined using exposure fusion. I find this results in a more naturalistic presentation than HDR+Tonemapping, especially with the local contrast adaptation boosted to 11. Both cathedrals in Liverpool (Anglican and Catholic) are fairly modern being constructed in the 20th Century but offer highly divergent architectural styles. The Lady Chapel represents the more traditional end of the spectrum. The recent viral photo of a dress of controversial colour demonstrates that the perception of colour is a complex psychovisual phenomenon that involves not just the physical electrical impulses produced by the light receptors in the retina but also interpretation by the brain based on context and expectation. It also underscores the importance of getting your exposure and whitebalance correct. Philosophers have used colour in debates about the notion of “qualia“, or the “the ways things seem to us“. From a photographic perspective, we can understand how a dress which under normal lighting looks to be royal blue with black lace can look in the photo to many people as being white with gold lace. There are two issues with the disputed photo that contribute to the confusion, it is badly exposed and the auto white balance is extreme. I assume that the photo was taken by a phone and that the autoexposure was fooled by the darkness of the dress. The photo was consequently overexposed leading the royal blue parts of the dress being rendered a much lighter shade of blue. The dark lace parts of the dress are also brightened and now longer looks black. The second issue is that the camera then tries to colour correct the image by setting a white balance. It misinterprets the scene as being taken under high colour temperatures, e.g. at dusk with the illumination of a clear blue sky. To compensate, it changes the colours in the scene, effectively trying to make the blue dress look more white as it assumes that this is “actual” colour of the dress. To bring blue closer to white, the camera adds yellow to the scene (you can tell from the yellow colour cast to the background). The dark lace of the dress, already made a lighter shade by the overexposure, is now given this yellow colour cast which can be interpreted as being a golden colour, especially in the context of the rest of the dress which is rendered as palish blue. These two effects combine with the way the brain tries to work out what the colour of objects are from visual stimuli. Since our vision has to operate under many different types of lighting, what we perceive as colour of an object is not actually the actual colour cone responses, but what our brain retrodicts based on our assumptions about the lighting. An apple under noon day lighting will look different compared with viewing at dusk, but we don’t usually say that the apple has changed colour because our brain will take the different lighting conditions into account and interpret that the apple is the same colour. The case of the dress is simply a case of the camera being fooled together with the way our vision system operates.